When you turn that dial, you’re actually shifting many different thin layers of magnifying glass, which when re-positioned, amplify both the strength and clarity of your vision. This is an extraordinary discovery that is guaranteed to not only improve your vision but help keep your wallet fat as well. 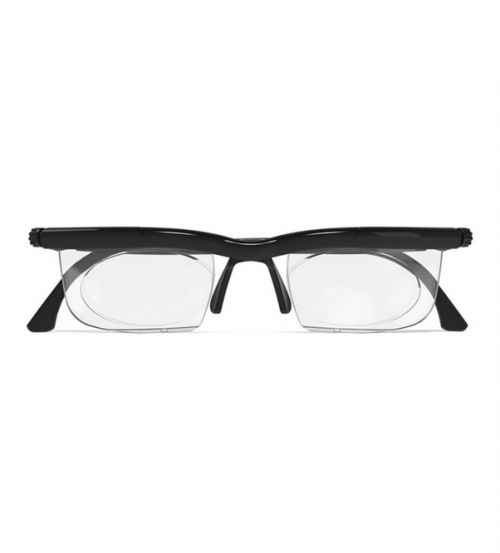 The only pair of glasses that allow you to customize the strength of each individual lens. With these, you can really get that perfect and unique prescription you've always wanted. The incredible sliding lens technology, designed by Oxford Scientists, will allow you to amplify your vision whenever you feel like it's necessary. You will never need to buy a new prescription again, just spin the dial! The frame is extraordinarily durable and can withstand even the roughest and rugged handling. No more worry about fragile frames cracking or bending! You have the amazing opportunity to switch from long distance to reading glasses in no time at all. Instead of carrying around 2 pairs of glasses, you can just have this one with you at all times and be completely fine. Due to high demand, please allow 2-4 weeks for USA delivery and 3-6 weeks for International delivery.